The Deluxe Metal Storette has a double lockable door and a lifting lid, making this an ideal storage solution with easy access. The shed is delivered in preassembled panels. 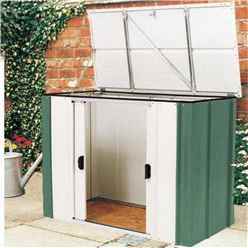 It is our easiest range to assemble and one of our best selling sheds. All metal sheds and storage must be erected on a firm, level (preferably concrete) base. You will need to purchase an anchor kit from a local DIY shop to secure your metal shed to the concrete base.